The main village street through Overton. Starting point for my walk. Living in Cheshire we are lucky that we have so many trails close at hand. Each year I set myself a target to walk at least one local trail and this year I planned out a series of walks along the Wat’s Dyke Path. 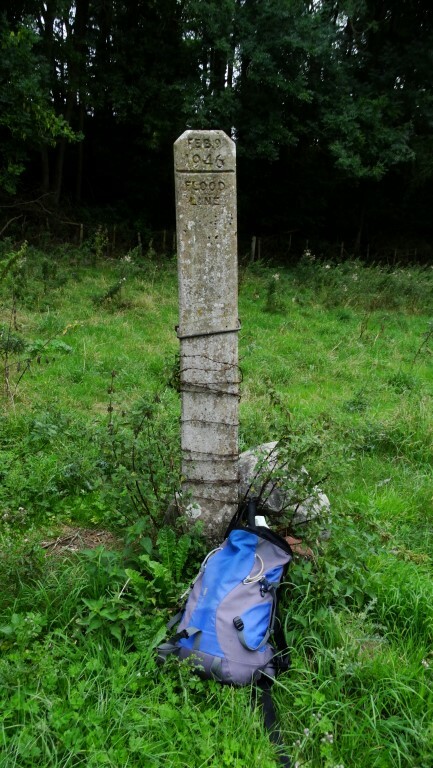 The 61 mile long trail follows close to the course of the embankment with the same name and generally runs parallel with its more famous neighbour Offa’s Dyke. Unlike Offa’s Dyke, Wat’s Dyke is a much smaller earthwork but predates Offa’s Dyke but its precise date has not been determined. 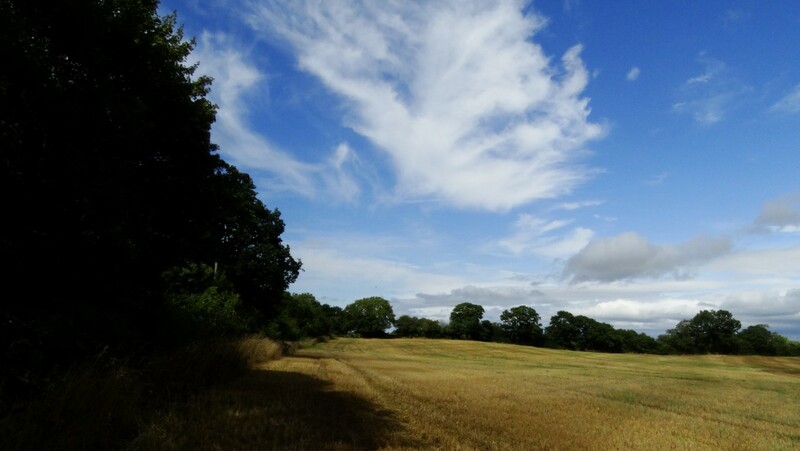 The southern end of the trail starts at Llanymynech south of Oswestry and winds its way generally north through Wrexham before reaching the coast at Greenfield, northwest of Flint. Splitting the trail out into several sections my aim was to park at the finish point for each walk and use public transport to reach the start. So it’s already August before I venture out on my first walk. Rather than start at one end and methodically work my way along the trail I have decided to start at the village of Overton which lies in that bit of Wales which infringes into England and often was marked on old maps as ‘Part of Flint’. Overton is not quite on the Wat’s Dyke Path but is a convenient starting point as the bus passes through the village. Leaving Overton, my walk descends to the valley of the River Dee. I’m starting off with a drive to Wrexham early and park up close to the town centre which means a relatively short walk to the Wrexham Bus Station. I time it well to catch infrequent bus service number 146 to Overton. I alight one stop early in the village as other people are getting off the bus and secondly the bus’s bell isn’t working which means I don’t have to shout down the bus to the driver to stop. In Overton, the church bells are ringing but other than that, the place is fairly quiet. The churchyard has some very elderly yew trees, one propped up with thick wooden stakes. I leave the village at the southern end and descend via a narrow concrete track which is busy today with tractors and trailers gathering in the harvest. At the foot of the slope, I cross a large field where combine harvesters are busy at work. Reaching the eastern bank of the River Dee I turn right to join the Wat’s Dyke Path and soon stop for my morning break on the river bank. The path beyond is good and well defined and runs for much of the way along the riverbank not that you could see much of the river due to the vegetation before skirting away to reach the A539. I have a little road walking here to cross the high Overton Bridge. This fine sandstone structure was built in 1814 after a previous bridge collapsed. A flood level post marking the height of water on the 9th of February 1946. I turn left after crossing the bridge onto a lane and after a quarter of a mile take a signed path downhill towards Erbistock Mill. The riverside path here is in great need of some tender loving care. Boardwalks are in a poor state of repair and many trees had fallen across the path or had been uprooted so there was some clambering about to do. I am glad to leave this section and I make my way across a field then along a rather overgrown path to Erbistock. This little community is certainly tucked away and is dominated by The Boat Inn. 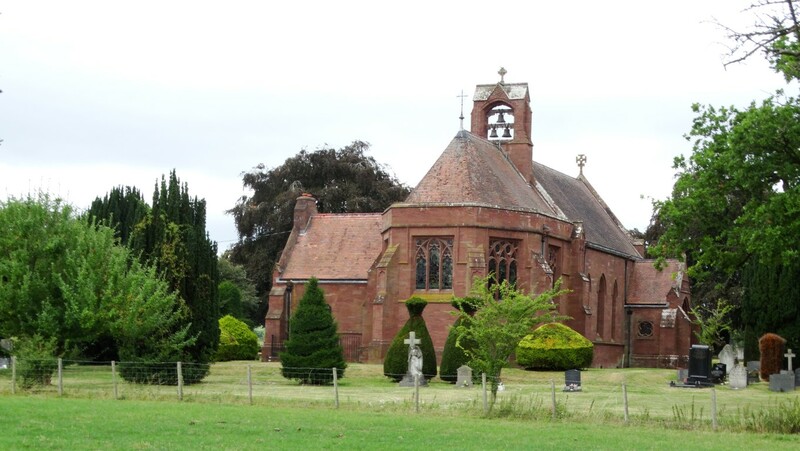 Nearby is the little church which was built in 1860 as a memorial to Henry Ellis Boates by his wife Caroline. At one time there was a foot ferry over the River Dee but this ceased in 1939. In its heyday, over ten thousand passengers were carried in a single year. From studying the map I don’t know why this ferry was so popular as there is only rural countryside on the opposite bank. 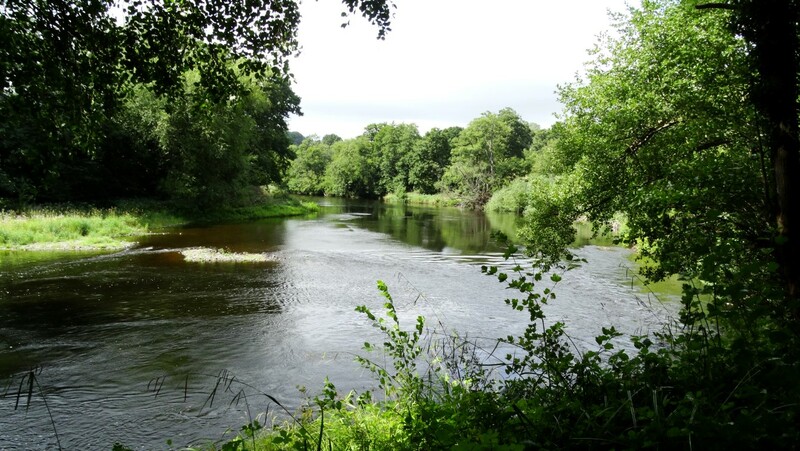 One of many glimpses of the River Dee west of Erbistock. The path west runs along a field boundary but this seems to wander down to the riverbank. I find out the hard way that this is a fisherman’s path and a dead end so have to clamber up a bank. Beyond, the path is again overgrown and hemmed in between the river and a steep slope with small sandstone cliffs in places. Where it opens out, I later take a path diagonally across a field to Lower Farm but now with a combination of a lack signposting, I go wrong which means squeezing through a bnarbwire fence to gain my intended path. From the river valley it is a short ascent to higher ground where I follow a path to a lane. With a right turn I soon reach the little neat church at Pen-y-lan and despite no seats in the churchyard, it is a good place to stop for lunch. Lunch stop in the churchyard of Pen-y-lan Church. A fine building but in a isolated location. After lunch it is mostly field walking, initially through pastures and some fields with grazing cattle. Near Yellow Oak Farm I take a wrong turn as the signage is misleading so have to back track a short distance. I now have some pleasant walking as the sun has decided to make an appearance. With the fields harvested and crows in the trees, it feels as if autumn was just around the corner. At Dininlle Farm I am greeted by two barking dogs but at least they are friendly. I cross further fields and later a lane to continue through the grounds of Wynnstay Park. There are a few glimpses through the trees to the large Wynnstay Hall. The original owner, Sir William Williams came to prominent after the English Civil War and a series of marriages into the local gentry ended up with the family becoming one of the biggest land owners in northeast Wales. The family also owned several hotels/coaching inns and hence the large number of ‘Wynnstay Arms hotels’ around this part of the world. Heading towards Wrexham alongside the Wat’s Dyke Path. Pleasant walking under sunny skies. 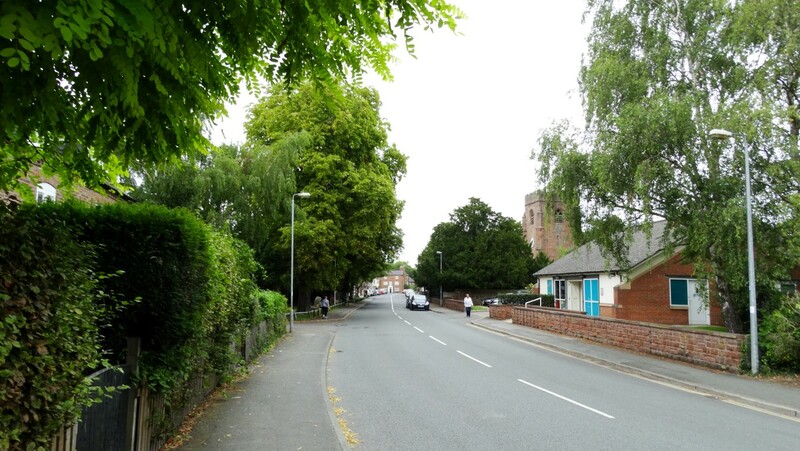 Reaching the A539, I turn left and shortly right to walk parallel with the Wat’s Dyke. The bank and ditch is visible over the next few miles but in most places very overgrown. The path runs north along field boundaries but in many places crops have been grown to the field edges and prior to reaching Pentre-clawdd Farm and beyond I have a few fields of fully grown maize to push my way through. I am just glad that the ground and vegetation is dry. For now, the sun continues to shine locally but further west it is quite overcast and the cloud cover will eventually win out. At Middle Sontley, I pass through a farm with many caged dogs and the way beyond is via a area of rough ground then a field where the wheat had been grown right up to the boundary. At the end of the field I am met by a barbwire fence and I have to squeeze through this. It is here that I find that the path has been running along in the adjacent field. Back on course, I head on to reach Erddig (National Trust). Many visitors are leaving via the drive I was walking along. I skirt the property on the western side which involves walking through the Erddig Country Park. After crossing the River Clywedog, a short ascent takes me into the southern suburbs of Wrexham where it is then all residential road walking back to the car. So what are my first impressions of this trail? Way-marking is a bit patchy in places but it does exist. I feel that few people walk this trail and hence some paths are somewhat overgrown and a bit of path maintenance wouldn’t go amiss. Having walked this first bit of this trail the only reason I strayed from the path was due to the lack of signage. 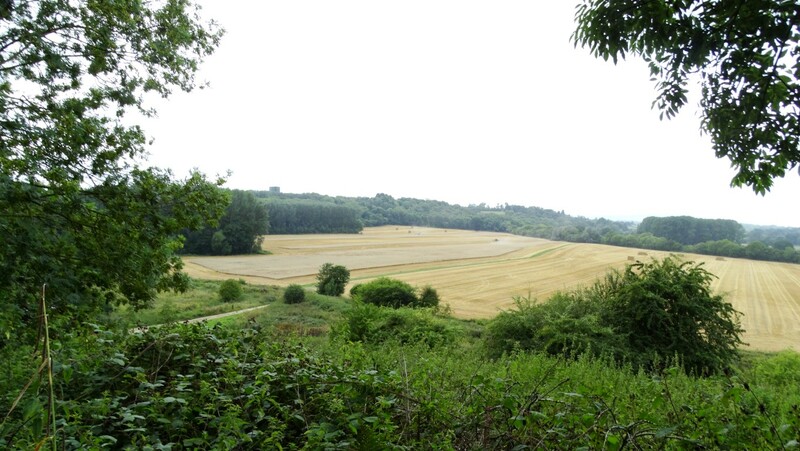 Overall, the trail passes through some interesting and very rural countryside. There is a detailed guide book to the trail written by Pete Lewis and published by Alyn Books. Directions are interspersed with historical features along the trail. For me, I rather read this prior to walking as I didn’t want to be walking with my head in a book.